Finally some sweet new vehicle details have been released! Read the new Destiny drawing board below or on Bungie.net. The world of Destiny is an immense frontier. Your missions as a Guardian of the last safe city on Earth will cover a lot of ground. 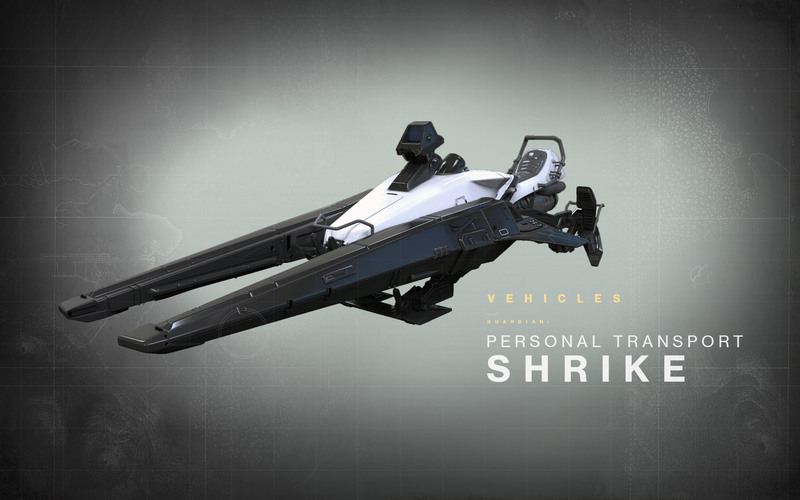 To propel you from one location to the next, no matter which destination you’re fighting to recapture, there is the Shrike. It swallows the landscape like a bird of prey with an insatiable appetite for scenery; be it the crimson dunes of Mars, the lush jungles of Venus, the dusty craters of the Moon, or the rusted wastes of our own homeworld. “Each paint scheme has its own distinct color palette to reflect progression,” Doyle concludes, forecasting an evolution that will match your own. Your Shrike is just one more way to tell your fellow Guardians that you’ve seen things they wouldn’t believe. This is just one vehicle in an ongoing series in which we’ll dig into the finer details of our upcoming first person action game, and explore how every element shapes the brave new world where your adventure will take place. All items, details, names, and pieces of random trivia are subject to change or sudden redesign on the assembly line.